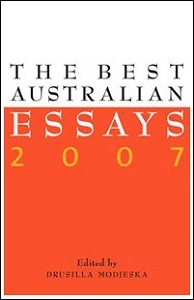 The Best Australian Essays 2007 is a rich and diverting collection of essays, compiled by one of Australia’s finest writers, Drusilla Modjeska. As well as showcasing some of Australia’s best non-fiction writers, Modjeska demonstrates through her selection the wonderful versatility and beauty of the essay form. Drusilla Modjeska is possibly one of our most acclaimed writers. She was born in England but has lived in Australia since 1971. Her books include Exiles at Home, Banjo, NSW Premier’s Award-winning Poppy, Sisters, which she co-edited, the Nita B.Kibble, NSW Premier’s Award and Australian Bookseller’s Book of the Year Award winner The Orchard, Timepieces and Secrets with Robert Dessaix and Amanda Lohrey.